I love snacks. I would much rather eat several small meals than huge ones. Maybe because I loooove food and the thought of eating different types of food all day is quite a treat to me. Also, being a runner, I get hunger pains and need a quick fix! Eating my arm ain’t pretty, folks. You don’t want to see me get HANGRY. This is basically my version of the coconut Lara bar. 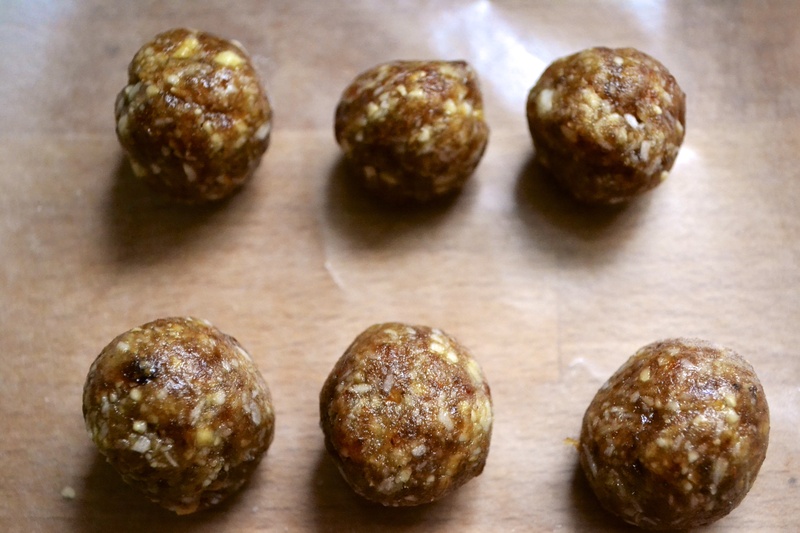 These little balls are all over the food blogosphere, but I had never had a chance to make them until now. For Food Matters Project Monday, Cheese Please chose Cheese-Nut Balls from Mark Bittman’s Food Matters Cookbook. My hubby is dairy free, so I swapped out the cheese for dates and made individual snack bites. 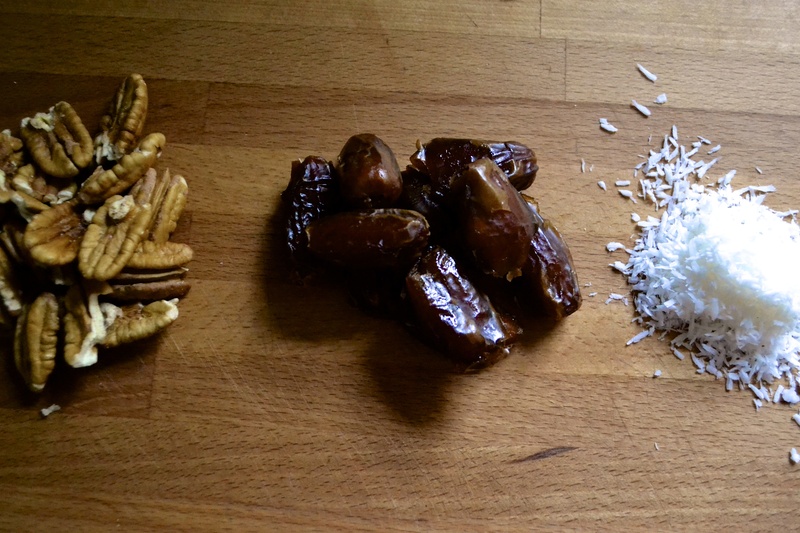 These Nutty Coconut Date Balls are perfect little energy snack bites. The dates taste like caramel goodness with smacks of coconut. Feel free to roll them into balls or press them into a sheet pan and cut them like bars. They make great travel food! Add the dates one at a time through the feed tube of the food processor while it is running. The dates will turn into a date paste. Add the nuts. 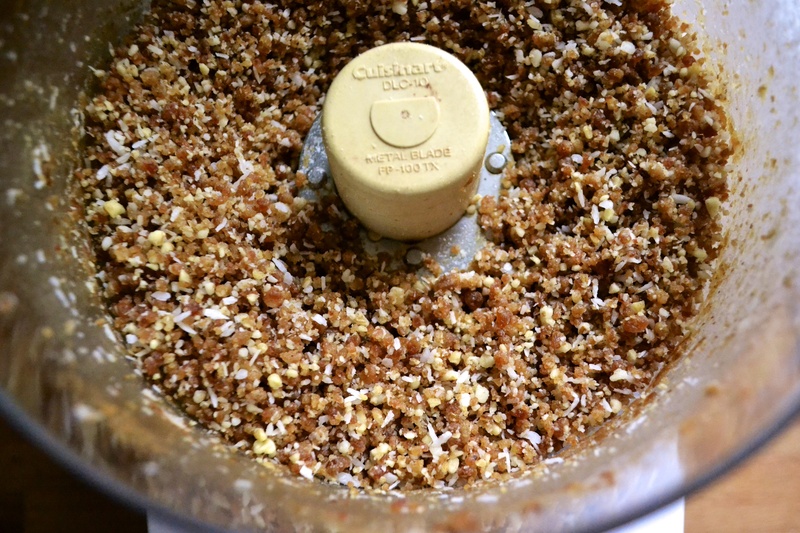 Process until the consistency appears like cake crumbs, but it will easily stick together when you press the mixture between your fingers. Add salt and coconut. Pulse until mixed. You can either make these into bars or balls. If making into balls, simply remove the blade from the food processor and take one tablespoon at a time of the mixture and roll it between your palms until a ball forms. 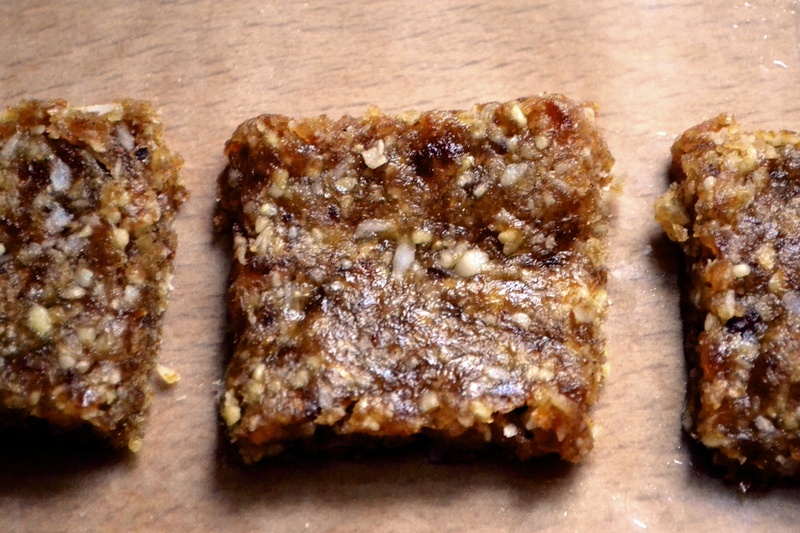 To make bars (like larabars), put the mixture into a shallow baking pan and press the mixture into it. Seal and store in an airtight container in the fridge until you are ready to serve it. These will last up to 2 weeks in the fridge or longer in the freezer. Ooh, I love dates! Great recipe! I am also frequently in danger of getting hangry, so will most definitely be trying these out. Nice! I make variations of these little guys all the time, they make such great snacks. Love these Alissa! A friend just gave me a box of dates fresh from Palm Springs. I think I will give this a try. Fresh dates?!?!? Holy pooh, I bet those are delicious!!!! I’ve been looking for something easy like this! Thanks! Those sound like a perfect postrun snack! I always blame my affection for small meals and snacking on running too, but the truth is I’ve always been like that. YES! this is exactly what i make to eat right after a run, if i’m out of larabars. they are so tasty and so very good for you, love them. The coconut does it for me, recipe went on my to do list. Once I have my food processor back.